The Rocks are set to welcome back several of their absentees as they look to launch a late-season surge to the play-offs when they host Leeatherhead on Saturday. 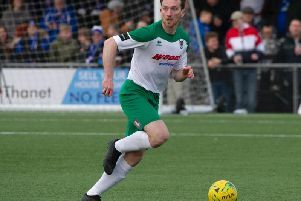 Bognor were left with just eight fit and available players in midweek and had to get agreement from the Sussex FA and opponents Brighton for their Sussex Senior Cup semi-final to be postponed. The picture is much brighter for Saturday although the Rocks will still be without several key players through injuries which have hampered their bid for a top-five finish. Poor defending has added to their woes and Saturday’s visit to Enfield had them 2-1 and 3-2 up late in the game only for the hosts to equalise, leaving Jack Pearce and Robbie Blake’s men without a win in five. For Tuesday’s semi-final, which has now been pencilled in for Tuesday, April 9, at Sussex FA QQ at Lancing, the Rocks were without Keaton Wood, Jimmy Wild, Mason Walsh, Dan Lincoln, Jimmy Muitt, Calvin Davies, Doug Tuck and Gary Charman (all injured), skipper Harvey Whyte (away), Ed Sanders, Joe Tomlinson and Joe Bennett (cup-tied) and Leon Maloney (recalled by Pompey). The manager said availability was much better for Saturday’s tussle with the Tanners – and he revealed a new signing was possible before the weekend. 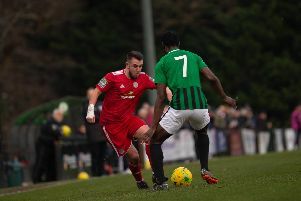 Midfielder Tuck should be fit after a calf muslce problem, while keeper Lincoln may be over a hip flexor problem and centre-half Keaton Wood is fit after picking up a knock at Enfield – which came soon after his return following five months out with a knee problem. Striker Jimmy Wild should feature after knee trouble but is not yet ready for 90 minutes, while defender Sanders and midfielder Whyte are both available again. Bognor should have both their young Pompey forwards Brad Lethbridge and Leon Maloney available, and can use Pompey academy keeper Peter Duran if they need to after he joined on loan to cover for Lincoln and played at Enfield. Left-back Joe Tomlinson, who hurt his ankle in the defeat at Margate 12 days ago, is unsure of his return date. But full-back Davies (knee) looks to be out for the season while top scorer Muitt (knee) will feature – at best – only in the last couple of weeks and Charman (broken collarbone) won’t be seen again this term. Wood has told of his relief at returning to action. In an interview in this Saturday’s programme, he said: “This injury has been the worst time of my football career to date really. It’s been a very long time since September, and I’ve personally had a lot to deal with it the time. Pearce and Blake insist hopes of making the play-offs are very much alive but admit wins need to come sooner rather than later. The Rocks are five points off the top five with seven games to play. Pearce said: “Five points is do-able and it does make you wonder where we’d be if we’d kept the squad as fit as we’d have hoped to. Blake said getting into the play-offs would be tough but added: “We can still do it. That’s no win in five and the blip has come at the wrong time. “The lads are giving tremendous effort to the club but we just haven’t been good enough. You can’t keep taking the lead and not holding on but you can’t fault the work ethic. Blake was upset to see the Rocks fail to hold on to their lead late in the game at Enfield, where the hosts scored an 86th-minute equaliser. He said: “I’m disappointed but I’ve said that too many times this season. “We got a point in the end but games are running out. We have aspirations of getting into the play-offs and that’s a disappointing result having led 2-1 and 3-2. We couldn’t sustain it and see it over the line. Blake said the team’s record of 51 goals conceded was too poor for a team with play-off hopes. He admitted it was the same defensive issues cropping up. “This is not an excuse but we have had a lot of injuries,” he said. “We lost Keaton for five months, Calvin for three months. Keaton comes back then you lose Joe Tomlinson.